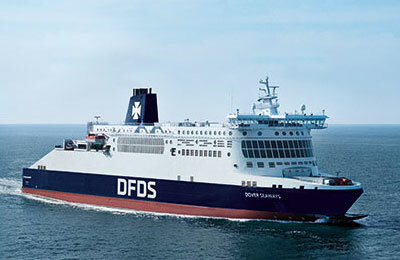 Newhaven ferry port in Sussex is situated between Brighton and Eastbourne, offering regular ferry services to Dieppe in France. Newhaven lies at the mouth of the River Ouse, in East Sussex in England. The town was formerly known as Meeching, but after the establishment of a harbour in medieavel times, the area became known as "New Haven", and "Meeching" gradually fell out of use. Newhaven continued as a small port town until the opening of the railway line to Lewes, in 1847. The railway company their own wharf and facilities by the river, and opened the Newhaven harbour railway station and funded improvements to the harbour that enabled it to be used by cross channel ferries. Newhaven launched it's Marconi Radio Station in 1904, achieving regular ship-to-shore radio communications by about 1912. The site of Newhaven Fort, on the cliffs overlooking Seaford Bay, has been used as a coastal defense since the Iron Age with more men and guns positioned there in times of national crisis such as the Spanish Armada and the Napoleonic Wars. Following a visit from the Duke of Wellington in 1855, and by the late 1850s Prime Minister Lord Palmerston, perceiving a threat of invasion by the French built seventy-two coastal forts, including the one at Newhaven. Today, Newhaven remains a lively seaside town, with great links from France to the South of England. Port address: Newhaven Ferry Port, Railway Approach, Newhaven, East Sussex. BN9 0DF. If travelling from Brighton, travel east along the A27 past Lewes and take the A26 to Newhaven. Once in Newhaven follow signs to Newhaven Ferry Port. The port is located just 64 miles from London, 10 miles (East) from Brighton and 15 miles (west) from Eastbourne. Newhaven Town train station is a short walk (3 minutes) from the passenger terminal. Trains operate directly to London, Brighton and Eastbourne. Please do not alight at the Newhaven Harbour station. There is a regular service between Newhaven and Brighton, Peacehaven, Seaford, Bexhill, Folkestone, Dover, Rye and Hastings (routes operated by South Coast Buses and Brighton and Hove buses). National Express also operates a regular service both from and to Newhaven from various places across the UK. Located inside the terminal building, the 'Haven Café' serves a large selection of cooked meals, lighter bites, sandwiches as well as hot and cold drinks. The café is open everyday from 06.30 - 11.00 and from 18.30 - 22.00. There is disabled access as well as toilets located inside the terminal building. Assistance with boarding is also available. Parking facilities are available just inside the port situated on the left hand side of the terminal building. Tickets can be purchased at the reservation desk in the terminal building and the charge is currently £4.50 per 24 hour period. Tickets cannot be pre-booked but it is rare that the car park is full.